Hispanics are the only major racial or ethnic group to see a statistically significant decline in its poverty rate, according to 2013 Census Bureau figures released this week. 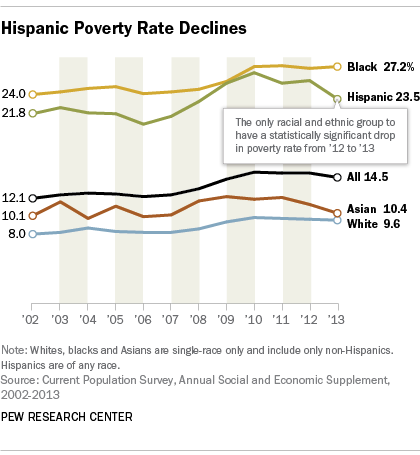 The drop in the poverty rate among Hispanics – from 25.6% in 2012 to 23.5% in 2013 – contributed to the first decline in the nation’s overall poverty rate since 2006. Hispanics also were the only group to see a decline in the number of people living in poverty (the year-to-year changes in the overall U.S. number was not statistically different.) From 2012 to 2013, the number of Hispanics in poverty dropped from 13.6 million to 12.7 million, even as the Hispanic population grew by 1 million over the same time period. Meanwhile, the median household income of Hispanics increased by 3.5% to $40,963, the first annual increase since 2000, according to the Census Bureau. Income changes for whites, blacks and Asians were not statistically significant. Hispanics are over represented among the poor, making up 28.1% of the more than 45 million poor Americans and 37% of the 14.5 million children in poverty. Overall 17% of all Americans are Hispanic. High rates of poverty still exists among the youngest and oldest Hispanics, according to Census data. About 30% of Hispanic children under 18 live in poverty, compared with 20% of children nationwide. Hispanics have the highest number of children in poverty (5.4 million), a trend that began with the Great Recession. In the oldest age group (65 years or older), Hispanics have the highest poverty rate of any racial or ethnic group. One-in-five (20%) of Hispanics in this oldest age group are poor, compared with about 10% nationwide. One possible explanation for falling poverty and rising income among Latinos is the group’s improving labor market situation. From the fourth quarter of 2011 to the fourth quarter of 2013, the Latino unemployment rate fell from 11.3% to 8.8% (the U.S. overall has a lower unemployment rate). However, despite recent gains, unemployment rates remain above 2007 levels, when 5.7% of Latinos were unemployed in the third quarter of that year. In addition, many new entrants to the labor market are U.S.-born Latinos, who generally have higher levels of education and greater fluency in English. Hispanics born in the U.S. are more likely to have more education than the foreign born: More than half (51%) of the U.S. adults 25 years or older have completed at least some college, compared with about a quarter (26%) of immigrants. Among Hispanics, the U.S.-born are also more likely than immigrants to speak English at home. About nine-in-ten (89%) of U.S.-born Hispanics say they speak only English or speak English very well at home, compared with about one-third (34%) of Hispanic immigrants.